The false concept that workers are exploited by employers forms the basis for demands for a minimum wage. It is a concept that dates back to 1776 and the publishing of the Wealth of Nations. Few realize that this fallacy was first put forth not by Karl Marx, but by the father of Capitalism Adam Smith. The oft repeated communist phrase, “the whole produce of labor” was coined by Smith in his tome the Wealth of Nations. He falsely believed labor to be the foundation of all wealth. Dividing the economy into three classes, he declared property owners (landlords), and capitalist made their living off exploiting workers. 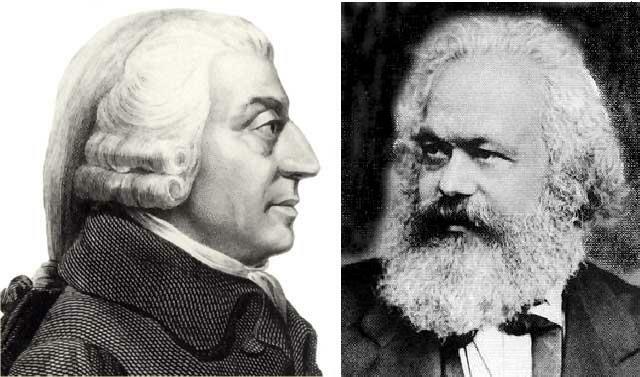 Marx and Engels refined Smith’s theorem into two main classes, the bourgeoisie and the proletariat. Building off of the reputation of Smith, they parlayed this belief into a whole new philosophy. The truth was they, or at least Marx, knew this was a lie. Classical Economists like David Ricardo had already corrected Smith’s error by the time the Communist Manifesto was published in 1848. What Ricardo, and others, showed was that economic activity is divided into two categories, neither having anything to do with the bourgeoisie or the proletariat. What makes the economy hum is the seeking after goods and services. All economic activity is related to one of these two. Workers, for their part, are no more than service providers. They provide a service, whether it be cooking meals at a restaurant, or putting bolt “A” into hole “B”. For their services, they are paid according to an agreed upon price, usually based on the going market rate for such work. Whether these activities create any wealth has nothing to do with the amount of work done by the employer or the worker, but wholly depends on if anyone wants what is being produced! The idea that services provided by “employees” are somehow different then that of the landscaper hired to trim the bushes, or the doctor taking giving an exam is nonsense. Services are services, no matter if it is done on a one time basis, or part of a daily routine. The contract that exist is the same in both instances, and the right to remuneration for services rendered at the agreed upon amount is essentially the same, no matter what the IRS says. This, in a nut shell, is the right of contract. All people have the right to sell their lawful services for whatever amount they can get, and those contracting for such services are committed to pay that price on the terms both agree to. Understanding this basic principal is essential to understand why the minimum wage is immoral. In fact, it is the this very reason the Supreme Court found the minimum wage unconstitutional over and over again. Only after Franklin Roosevelt was able to install enough liberals on the Supreme Court did that situation change. Ignoring long established principals, individual rights, and court precedent the Justices twisted the Commerce Clause to justify the unjustifiable. Before this seismic shift, it was accepted that employment was a service contract the government had no right to interfere in. There is simply no good defense of the minimum wage, none! The often repeated charge of protecting workers from exploitation falls flat if given even a casual inspection. If someone willingly does a service for another at an agreed upon price, neither is exploiting the other. It is a win-win situation. The only exception could be if the contracting party hid the danger of the work involved, or demanded extra services not agreed upon beforehand. Short of such fraud, charges of exploitation are fallacious. The business owner is no more taking advantage of the worker by accepting his services than the worker is taking advantage of the business owner by taking his money. The idea that an employment contract, if ongoing, forms a special relationship that obligates the “employer” in some special way is a socialist construct. It infers that the relationship is somehow inherently exploitative and the relationship requires government interference. The truth is, such interference is a basic intrusion on the right of contract, and has no moral or legal basis. This is not to say the man making $7/hr wouldn’t like $10,$15, or even $100/hr; correspondingly, the person paying for those services might wish he could get away with paying $2/hr or even getting the work for free. The acceptable wage is a compromise for both parties, one they both find acceptable even if it is not ideal for either. That both find the wage offered acceptable is what makes the end result a win-win situation. For those .001% of minimum wage earners trying to support a family, what they need is a way to boost their earning potential, not some leftest waving a magic Living Wage wand. Such gimmicks only cost jobs, reduce opportunities, and trod on the people’s right of association and make contracts with each other.